As you see on the video, Phillips is surrounded by youth. He keeps playing his drum and singing. 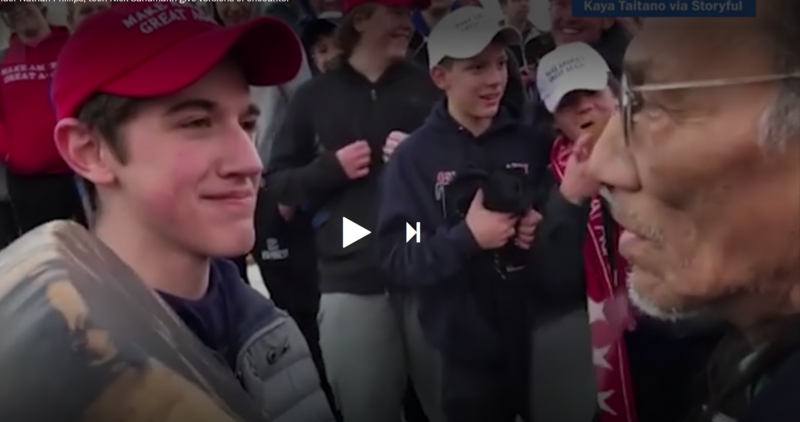 One youth in particular, junior Nick Sandmann, seems to block his path and smirk. The video created a national controversy and criticism of the school and the youth. Screen capture from Washington Post video. That fails to take into the broader context of Phillips being surrounded by youth. Some of Sandmann’s classmates chanted “Build the wall” and “Go back to the reservation,” according to the AP account. From the video, some of the youth are doing the Tomahawk Chop and some seem to be treating the situation as amusement, smiling and taking photos. And several students, including Sandmann, wore MAGA hats, which have become synonymous with a racist world view. Phillips has been the focus of much of the news coverage, but the story is as much about the anger from black men that triggered the incident. Their anger shouldn’t be surprising. But people who don’t know the history of slavery, Jim Crow, lynchings, and redlining — and their present day manifestations of mass incarceration of black men and the incredible wealth disparities between blacks and whites — won’t hear the truth and trauma behind that anger. Anger is hard to hear. Consider this. How many of us have gotten angry and cursed when someone cuts us off in traffic? How much angrier would we be if someone cut us and our family off from opportunity for generations? It’s hard to blame the youth for reacting to the anger (though you do wonder where the adult leadership was.) The youth’s actions weren’t thought out. In such tense situations, we all pretty much run on autopilot, playing out our habits. These youth are acting out in ways they absorb in their families, community and school. I’m not saying they should have engaged in dialogue. Sometimes the best thing we can do is not get defensive, turn the other cheek, and simply walk away. Sometimes we are called to engage. That’s what Phillips did. He saw a stressful situation and took the risk of walking in alone and giving his best, more prayerful effort, at calming things down. You’d hope the Covington High youth, their school, and their community would learn from this experience, that we all could learn from this experience. This is America’s story. We all need to talk about it. We all need to learn. We all need to be transformed. It’s a painful path, but it’s our only hope. The “innocence” of the Covington boys is further contradicted by at least 2 videos of their actions along the parade route. If I were a part of the school’s administration, I’d have serious questions for the supervisors/chaperones who allowed them to wear MAGA hats to politically charged events and didn’t stop them from the jeering and insensitive actions. I love this post. Thank you for writing it. Gives me a sense of hope.